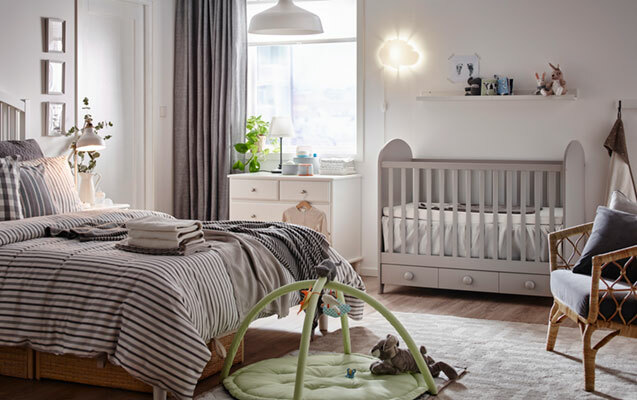 When you have to fit both a nursery and a bedroom into one room, minimalistic baby furniture can be the key. In this room, for example, you can see a GONATT baby cot that combine well with the parents' bed and the colour of the walls. A calm interior brings sweet dreams to parents and their baby, while a LEKA baby gym stimulates the baby's development of eye-hand coordination. What helps develop child's imagination? We believe it is a funny, bright and modern children's room interior. Just like this one! To create such interior, you don't need much. Just draw some decorations on the white walls and add other colourful accents, such as patterned quilt covers and pillowcases, low pile rugs, toys and specialized children's furniture. The light interior features FRITIDS/STUVA wardrobe and a table with toy storage, as well as TROFAST storage combination and a colourful, freestanding basket with room for everything from toys and clothes to important personal items. The children's room can be as bold as your kids. This one was furnished for an 11-year-old girl and a 8-year-old boy living together. It has plenty of room for both storage and hobbies, as TUFFING bunk bed leaves the floor space for STUVA storage system. A chest of drawers and wardrobe shelves are equally shared by brother and sister, and both of them have their own NÄPEN clothes stands for water suits or perfectly-ironed school uniforms. How to furnish a room for a baby? Since it will be definitely filled with colourful things, leave the walls white and choose modern baby furniture in the same or other neutral colour, like GULLIVER changing tables and cots or BUSUNGE chests of drawers. Then, add some children's books, toys and a colourful LEKA baby gym. This small-space children's room belongs to two sisters of 7 and 9 years old. 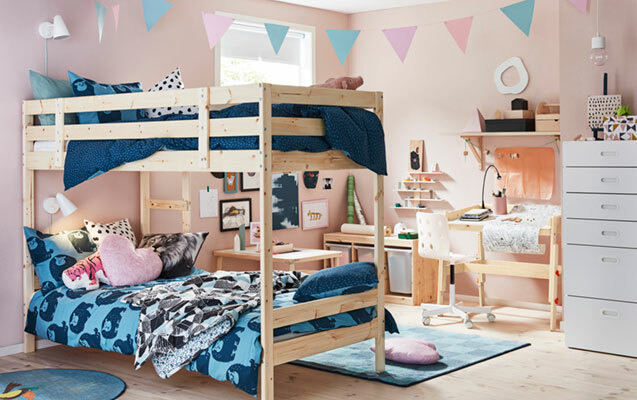 In this pastel world, there is plenty of space for all basic children's furniture: a space-saving MYDAL bunk bed, an adjustable FLISAT desk and a high STUVA chest of drawers for clothes, drawing tools and other things. Cheerful pillowcases and quilt covers, cushions and picture frames with drawings make this room cosy and even more personal. How to prepare home for baby? A spacious traditional style bedroom in this house in the suburbs ir a perfect room to set up a baby nursery on a budget and without any hassle. You will need baby furniture made of natural wood. A SNIGLAR changing table and a cot, for example. The cot base can be placed at two different heights and is well ventilated for good air circulation which gives your child a pleasant sleeping climate. A Scandinavian interior and baby furniture in traditional style are so versatile that they can suit for both a boy and a girl. 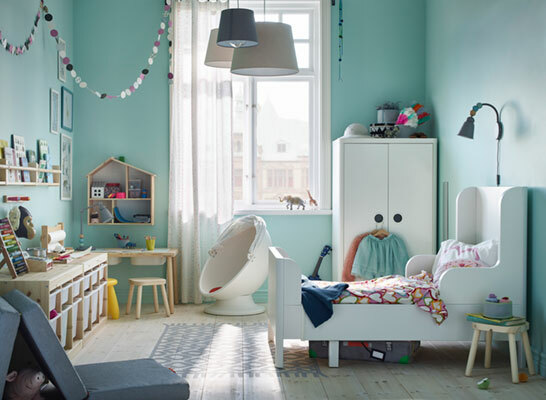 This light-coloured nursery features SUNDVIK furniture. A wardrobe and a cot are growing together with your child, and a changing table has practical storage space within close reach, so you can always keep a hand on your baby. And it’s easy to convert into a chest of drawers when your child is past the nappy stage. This is a room of a 3-year-old girl furnished with modern style BUSUNGE children's room furniture that grows together with her. You can adjust the height of the wardrobe rail and shelves, and the extendable bed can be pulled out when the child grows. Besides, the wardrobe is deep enough to hold standard-sized adult hangers (as well as the masters of hide and seek). Remember the name FRITIDS/STUVA. It stands for the basic children's room furniture combo that includes a loft bed, a desk with chest of drawers, a wardrobe and some open shelves. This modern furniture set is a smart solution for a boy of preschool age. 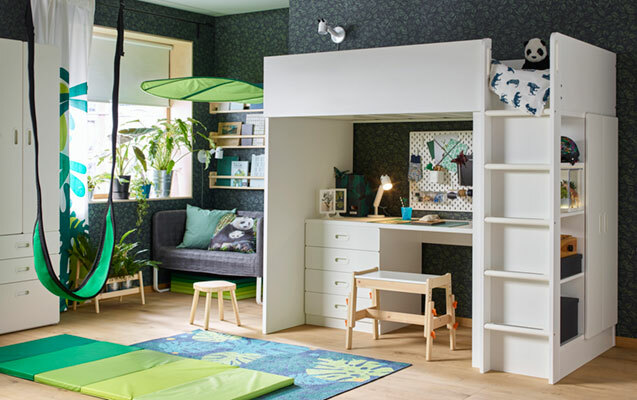 The room also features a FLISAT children's bench that stands for a swivel chair and some other important childish things, such as a GUNGGUNG swing, a SKÅDIS pegboard combination, a LÖVA bed canopy, a PLUFSIG folding gym mat, and a playful rug. Even a small teenager's room can be a great place for a 12-year-old boy's self-expression. This one is filled with dark colours and some bolder accents. 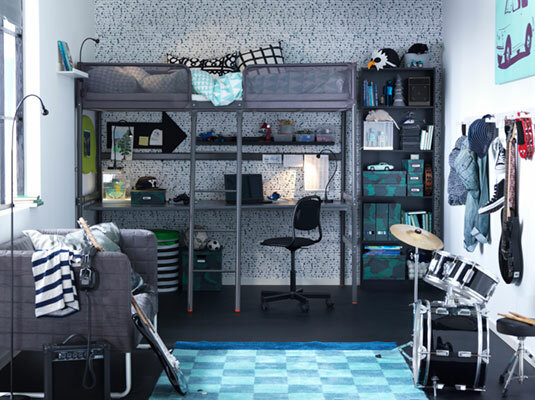 Patterned bed linen, rugs and posters help create a distinctive style and can be combined with youthful modern furniture, such as TUFFING loft bed completed with SVÄRTA desk top for homework and rest, or a KNOPPARP sofa for reading and guitar solo rehearsals. An attic or a children's room? Both. One room for two children with ease and in style. This attic room is dedicated to brothers of age 1 and 5. 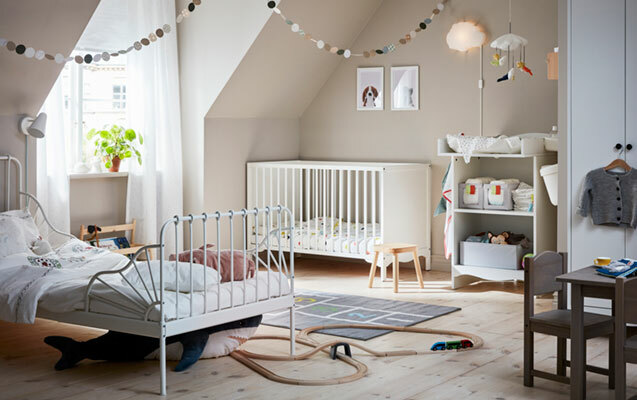 It features Scandinavian traditional style furniture: a SOLGUL cot and changing table on baby's side, and a MINNEN extendable bed with SUNDVIK table and chairs on toddler's side. Let's build your kid's own creative kingdom! Although the main colour of this modern room for a 8-year-old boy is white, it is still full of inspiration. Take a SLÄKT bed frame with storage and underbed (maybe a friend will stay overnight? 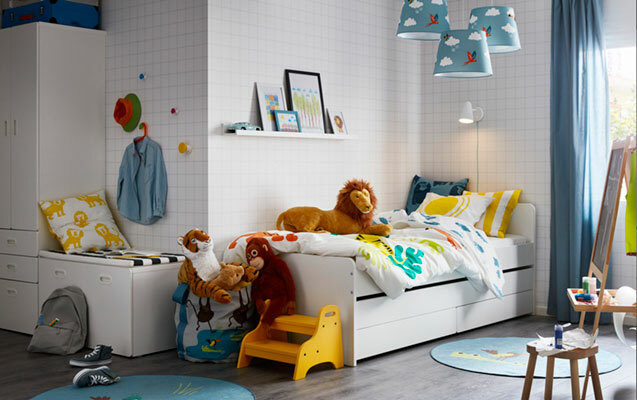 ), then add a STUVA wardrobe and many bold and playful details: a bright yellow TROGEN step stool that can be used to reach clothes and drawing tools that are stored higher up, colourful bed linens, rugs, children's lamps and educational toys!